Iridescence, from the Greek iris, meaning rainbow, refers to the property of some surfaces to change colour with viewing angle (Barnhart & Steinmetz 1988). 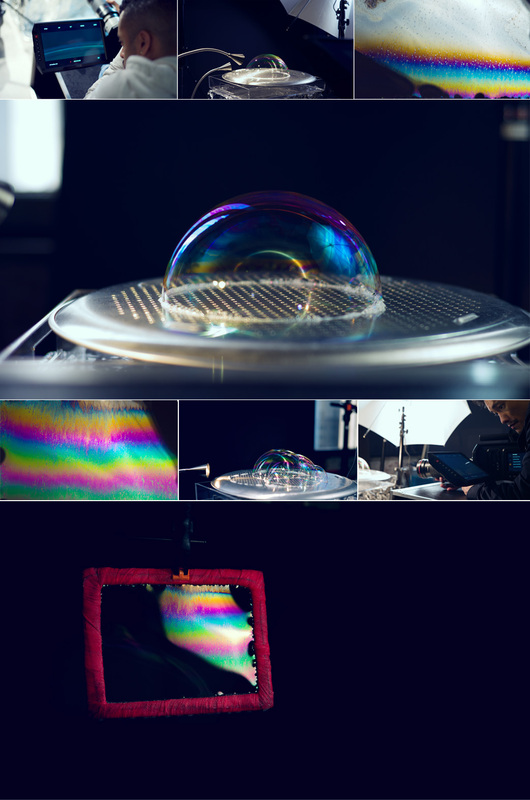 For the case of this experimental film, we decided to focus on the iridescent qualities on the surface of a soap bubble. Everything in the resulting film was shot practically on the Blackmagic URSA. The first thing was to understand the structure of a soap bubble and how light behaves with this structure. The surface or “skin” of the bubble is an extremely thin sheet of water trapped between two layers of soap molecules and this thin sheet of soapy water surrounds a bubble of air. When an incoming ray of light strikes the outer surface of the bubble, part of the light ray is reflected immediately, while the other part is transmitted into the soap film. 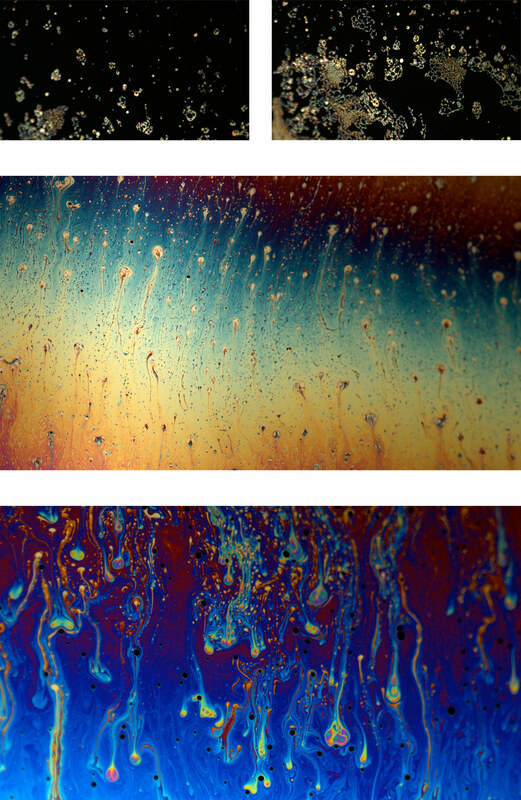 Light is reflected from both the inner and outer surface of the soap bubble and the thickness of the film determines wether iridescence is apparent. Through our initial experimentation, we noticed that a pattern emerged as the bubble “aged”. The colors transitioned through the same cycle during its lifespan, starting with hues of green and pink, going through blues and reds eventually ending on yellow hues that fragmented as the surface got weaker. This observation is best described on webexhibits.org – “The colors of a bubble are dependent on the thickness of the film. A bubble becomes thinner and thinner as it dries out (due to evaporation), before finally popping. As the surface film of the bubble becomes increasingly thinner, a change in overall color can be seen. Thick walls cancel out longer wavelengths in the red range. As the bubble film gets thinner, yellow wavelengths are cancelled out. As it gets even thinner, green light is lost. Beyond this point, even shorter wavelengths in the blue wavelength range disappear. The resulting colors are a combination of the colors that do not undergo destructive interference and their degrees of constructive interference. Blue-green colors dominate in thicker films and yellow hues in thinner films. Eventually, the film becomes too thin to create interference of visible wavelengths, as all wavelengths are cancelled out. At this point the bubble appears colorless. Against a black background the bubble surface could appear black”. 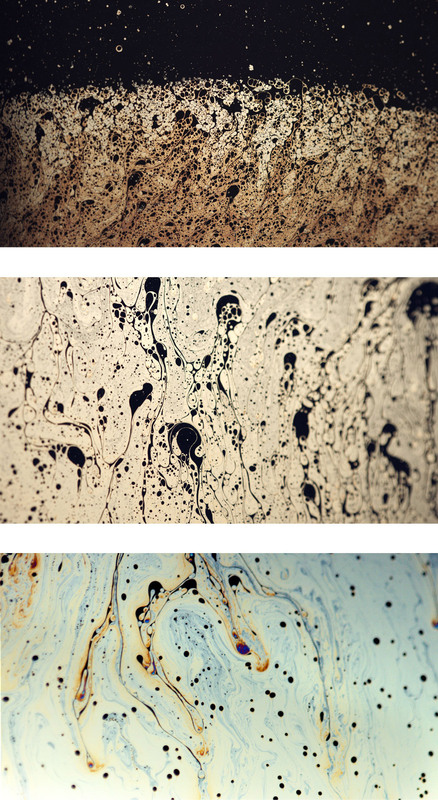 Opposed to having just a random string of interesting visuals, the concept of the resulting film was born out of the experimentation and observations we discovered early on: To document the behavior of iridescent colors on the skin of a soap bubble, for the lifespan of its existence – in reverse. After hours of exploration and failed attempts at getting the bubble to live long enough, we finally arrived at a very simple setup and perfect bubble solution which allowed the bubble to stay intact for at least 3-4 minutes. Behind the scenes imagery of our setup are below. For the final film, the sequence of events attempts to communicate our observations of the lifespan of the bubble and its iridescent qualities – in reverse.